After the water had stopped. Last week, I had a discussion with a couple friends about what we understood our happiest moments in life were and I revisited these thoughts again with my brother over dinner another day later. My life in this very moment is extremely joyful. I am about to marry a beautiful woman who loves and supports me and we are moving on to a new chapter of our lives. I have a wonderful home to live in, I have a creative career, and I have the time and flexibility to work on my own side projects. I have also attributed my joy to the freedom that I have rooted in Christ. In my own personal life thus far, I’ve found that everything I do is really for nothing. At the end of it all, I will die and I will leave everything behind in the world and carry no possessions, no trophies, no recognition. But through this desperate mindset, believing in God and knowing that I have found favor in His eyes through Christ, I can ultimately be free from the burdens of this life and really enjoy the relationships that I build. I’m a failure at life, I make mistakes, but I know that these mistakes are forgiven. Believing in that allows me so much more freedom to enjoy the life that is mine. After expressing these thoughts and musing to my friends and brother, my words were immediately tested. My brother and I were walking back to his apartment when I received a frantic call around 8:30pm from my fiancee to return home immediately. There was an emergency, our house was flooded. Immediately I rushed home to find as I open our front door what can only be described as rain. It was raining in our unit. 3 inches or more of water flowing out into the hallway. Our security guard as well as a few kind neighbors were already in the house desperately trying to clean up the water to no avail. I can see helplessness in the eyes of my soon to be wife and I found myself wading back and forth in the water unsure of what to do. I go upstairs to the bedroom area where the closets are and everything is covered in warm, tea colored water. 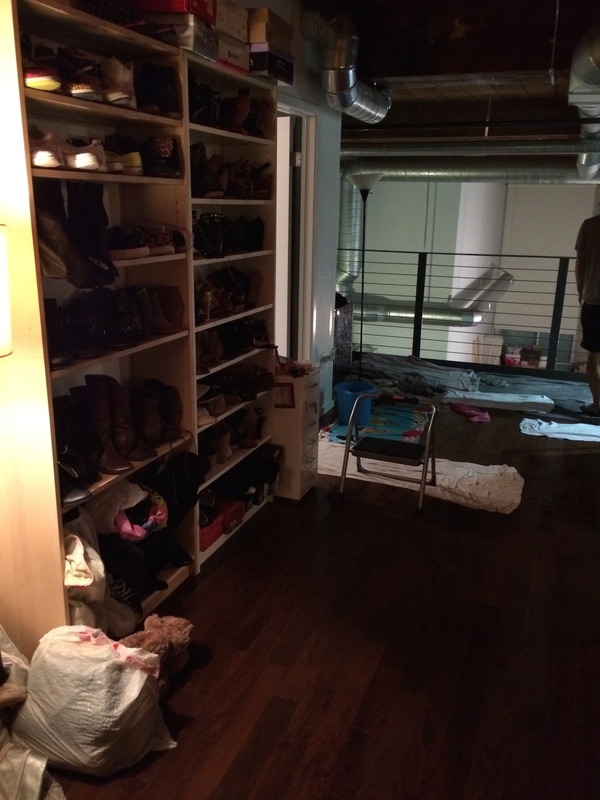 The cabinets were destroyed, my fiancee’s entire shoe collection glistening with a healthy coat of moisture and her entire shelves of high end purses, wet. Eventually it stopped raining in the unit and we finally learned the truth of the matter. Our neighbor upstairs had decided to draw a bath. They had forgotten that they had turned on the water and decided to go out for the night instead and left their home with the water still running. 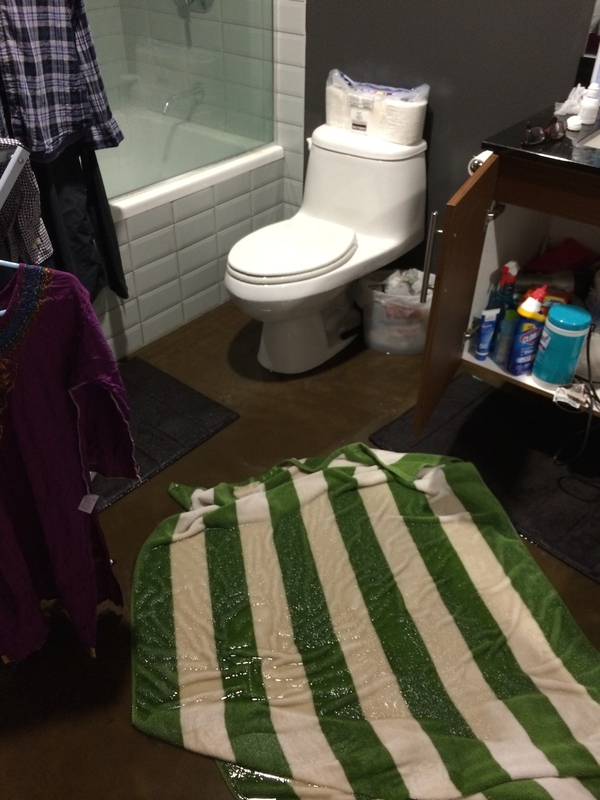 The designers of the entire building decided that it was aesthetically displeasing to have tubs that included overflow drains, and as a result, many hours of flooding occurred only to finally seep through their floors to water the non-existent plants in our home. The security guard had called an emergency water clean up crew whom I had met previously in the year for a minor water leakage case due to the neighbor even higher up from us who had failed to turn off their water while filling a fish tank, but that is a story for another day. The company came in with swift hands and quickly vacuumed up all of the water that was settled comfortably on our floors. Now comes the assessment at 2 am in the morning. Most of the furniture, Ikea closets and shelves, are all destroyed and the wood floors of the bedroom area are a total loss. It hadn’t even had time to dry and it was already warping. The floors need to completely be torn out in order to dry out the area underneath to prevent any potential molding from hot water and there was zero possibility of staying in our home. 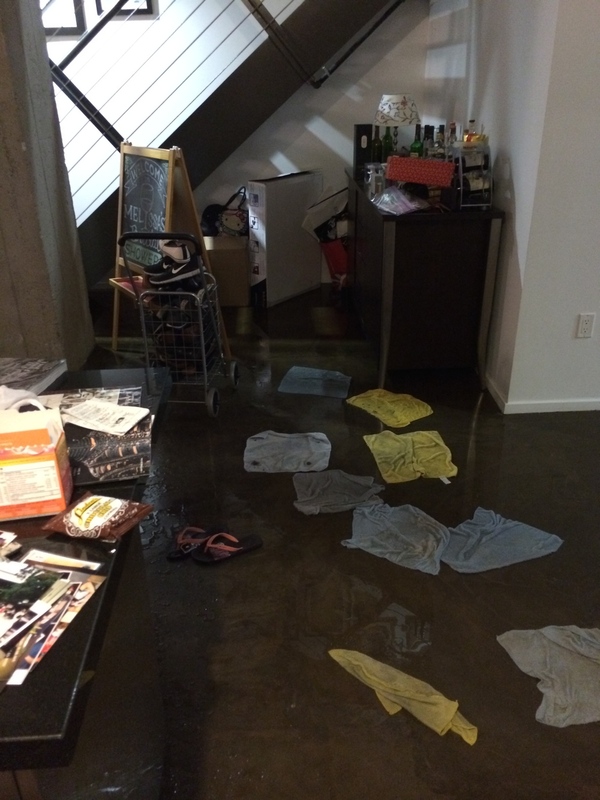 We were forced to move out in a matter of 72 hours due to one persons negligence. Over the next few days, a restoration company came through and packed out our entire home and put everything into storage. Luckily most of our wedding materials were undamaged except for my wedding shoes which were a total loss. Our wedding is now 2 weeks away and we’re scrambling to get everything done as well as getting everything squared away with this unexpected disaster. Despite all of these lemons being chucked at our face, we’ve been extremely blessed with the love and support of our friends and family. We have a temporary home to sublet and honestly, the situation could have been much, much worse. I think now you can understand my initial comment about my words being tested. Am I still able to enjoy my life and be happy? Yes. I have a soon to be wife who has been very supportive and calm through this entire situation, we have loving family to support us, and we have amazing friends that have come to our aid. Through this entire ordeal I will still say that I’m extremely and abundantly blessed by God and even though crappy situations may come my way through life, as long as I know to trust Him, He has already prepared the way. Not only that, but I strongly believe that He has used the moment to draw my fiancee and I closer together testing our relationship in stressful waters. So far, we’ve come out unscathed only a bit damp. There is still much to do as we prepare for the wonderful day of marriage but yes, I’m still happy. Life is good.